You have decided to start advertising on Facebook. Wahoo! This is a huge step in the right direction for your business. You may have noticed that in the past year, the reach of organic posts on Facebook has declined. Unfortunately, on all the social platforms, algorithms have shifted and in order to be seen and heard, you need to pay to play. Before you go and mindlessly toss money at the problem, there is some planning to be done and steps to follow. 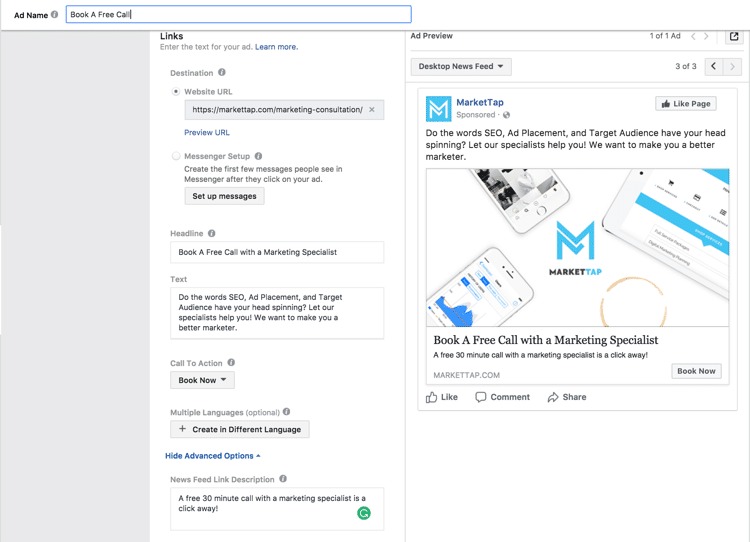 We are going to break down how to set up a basic Facebook traffic ad, step-by-step. 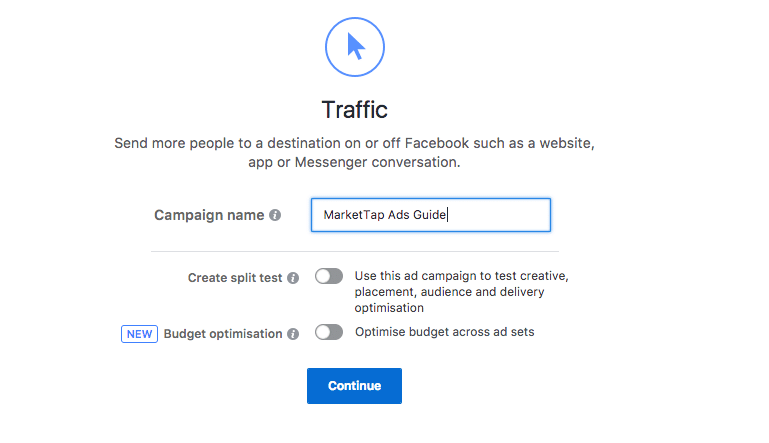 What is a Facebook Traffic Ad? A Facebook traffic ad is an ad format that will drive potential customers to your website. This format is to be chosen when the customer you are targeting is in the consideration stage of the conversion funnel. This means, your objective is to get people to start thinking about your brand and business and look for more information. 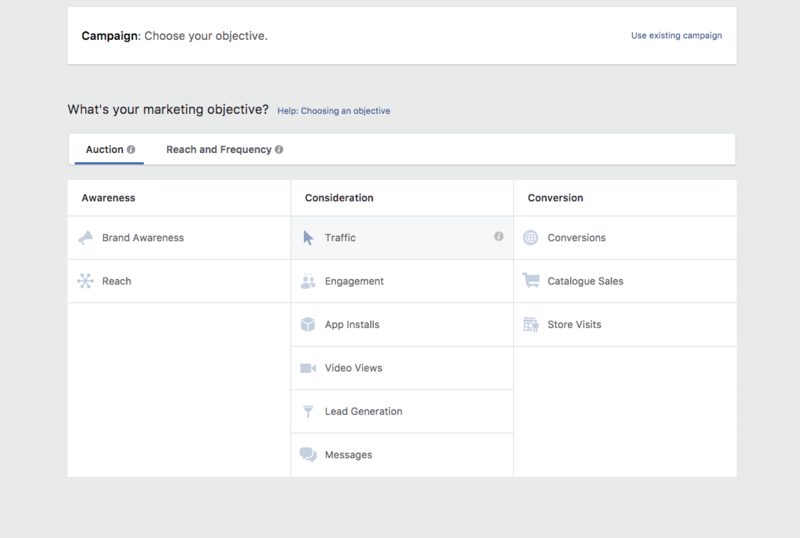 Open your Facebook Business Manager and choose the ad account you would like to create an ad for. Clicking on the ad account will bring you to Ads Manager. In the top right-hand corner, you will find a green button the says “Create Ad”. Clicking that will bring you to the first step of the ad builder. It is time to choose your objective. We have already decided that our objective is consideration and that we will be building a ‘traffic’ ad. Once you click on traffic, it is time to name your campaign! We suggest you give it a specific and descriptive name, relevant to your specific objective (No one can see the campaign name but you). During this next step, there are several important details that must be filled out. First, we will start by naming your ad set. Your ad set contains all the information about your target audience, ad placement, budget, schedule, and delivery. Name your ad set with a name that reflects the specifics of your audience. If this is your first Facebook ad, you will have to create a new audience. As a business, you should have research and detailed notes outlining your target audience(s). Need help with target audience research? Check out our service for this. 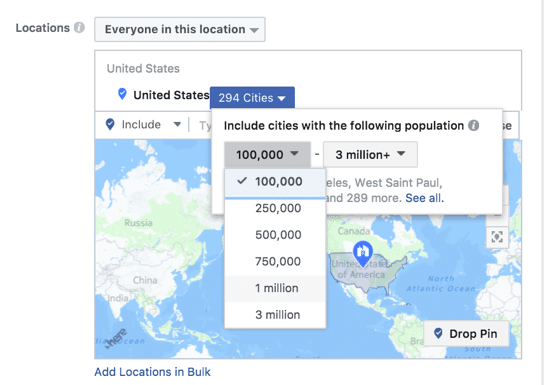 The Facebook audience builder allows you to zero in on your specific audience. It is important to create a detailed audience that is specific but not too narrow and wide but not too broad. We suggest that you keep your estimated audience around the 1.5-2 million mark. Let’s start with location. For the purpose of this guide, we decided to target major US cities. Start by typing in United States into location and press enter. On the right, you will see a small down pointing arrow. Clicking this will open a drop-down menu that lets you include or exclude certain areas. Go ahead and click “Only include cities”. We want to only include major cities. Beside “United States”, you’ll see it says “294 cities”. If you click this, you will be able to narrow down which cities are included by population. We are going to target cities with a minimum population of 1 million. Continue to enter the age and gender of your target audience. This is where you can get specific about your target audience. Enter details specific to their demographic, interests, and behaviors. As you type, Facebook will generate suggestions. Build your detailed targeting list. Remember to be specific but not limiting. You can check your estimated audience size on the dial in the top right corner of the page. 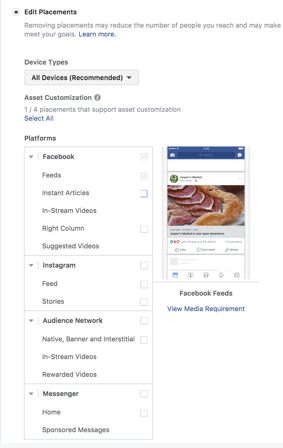 By default, Facebook will check automatic placements of ads. It is important to place your ad in front of your audience and not waste budget placing it where they aren’t. For the purpose of this example, we are going to be placing this ad solely on Facebook in the News Feed. For more information about ad placements, check out this article. Uncheck any placement that isn’t Feeds. 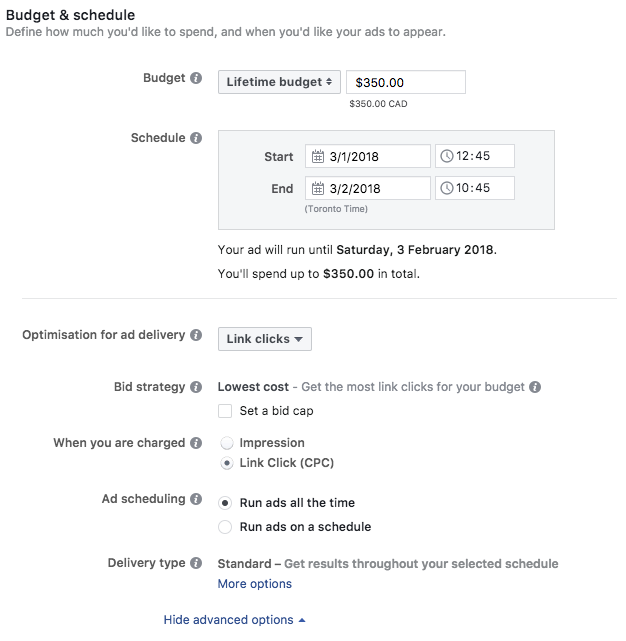 Although there is no right and wrong budget, it is important to give Facebook a healthy budget so that your ad will be delivered to the right audience and have a substantial reach. As for schedule and length of the ad, we recommend placing an ad for no longer than two weeks. If you want the ad to run longer than that, we suggest switching up the creative and copy so that your audience doesn’t get bored or hide your ad. Here is where you choose your optimization for ad delivery. 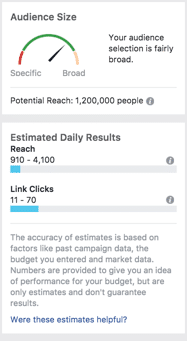 We (and Facebook) suggest optimizing your ad for link clinks. We also suggest changing when you get charged to Link Click (CPC). That way you know exactly what it costs each time someone clicks your ad. If you need help deciding on a budget and schedule, book a free call with an advertising specialist, and we would be happy to give some guidance! First off, name your ad. This name should reflect the creative (image) and what the ad is about. Then select which Facebook page you are creating this ad for. Now it’s time to build the ad which in this case, will be a single image ad! Upload the image that will act as the creative for your ad. Make sure that your image is in the correct dimensions for a Facebook Ad. Under Destination, insert the link you want the ad to drive the traffic to. Next, create a headline. This should be a descriptive call to action. The Text should describe what the ad is about. What will they get when they click your ad? Make this copy concise and intriguing. Be sure to keep it in your brand voice. Select your call to action. This should directly reflect what your audience will be directed to when they click your ad. The News Feed Link Description is a bonus spot to add information to emphasize why people should click your ad. Once everything is filled out, you can use the ad preview area to view your ad in different formats and placements. Congratulations! 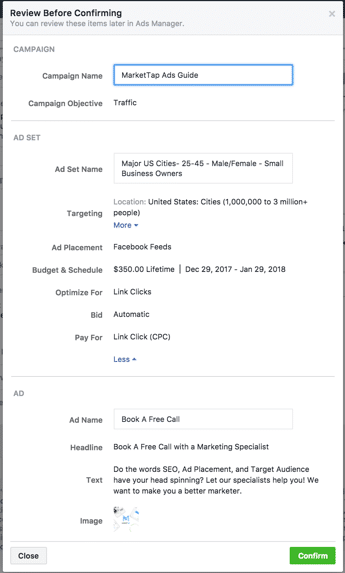 You have finished building a Facebook Traffic ad. We suggest you click the Review button to ensure you have not made any mistakes while building your ad. Once everything looks great, go ahead and click confirm! Your ad will be submitted for approval. Pending approval time usually takes no more than 15 minutes. However, it has been known to take up to 12 hours during busy seasons. Schedule your ads a few days before they are meant to go live so you don’t run into any approval wait time issues. While your ad is running, it is important to keep an eye on its performance. In Ads Manager, you will be able to view its performance and make any changes during its lifetime. 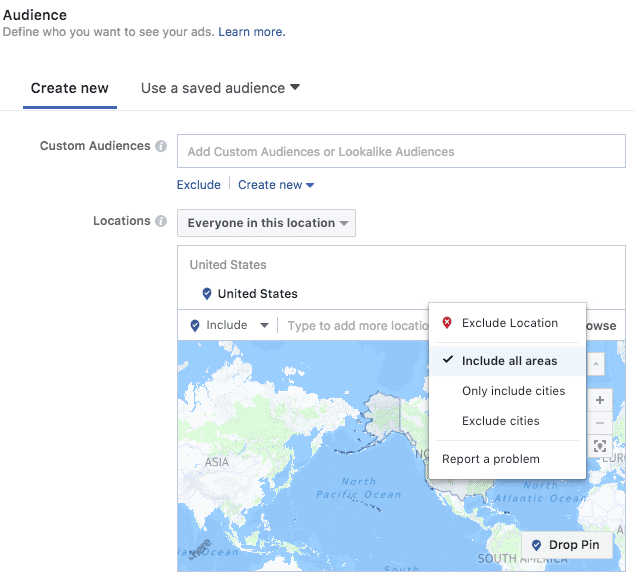 Want to advertise on Facebook but don’t have the time? Let us help you out! MarketTap offers two Social Media Advertising Packages as well as a la carte Social Media Advertising services.